So… sometimes you get put between a rock and a hard place with games at PAX West, like we were with Ninjala. Right off the bat, we need to say that we have nothing against Gung Ho Entertainment, they’re great people and we usually enjoy everything they bring to the party. However, this is one we really can’t let go and need to address. 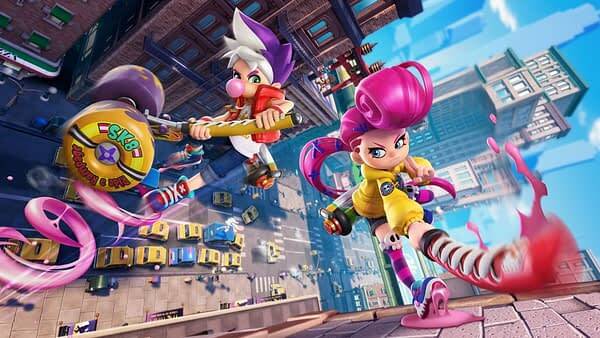 Ninjala is a game where you choose one of four kids who are blowing bubbles with gum and creating weapons as they skate around and try to take each other out. If that sounds like a parody of something familiar, it should, as this game basically played like a copy of Splatoon. It was a fun game to try out and a little interesting at times while we got our bearings, but a lot of this game from the characters to the menus to the levels to the victory stars at the end remind of us the Nintendo title. Hopefully, that changes a little before Ninjala comes out sometime next year. Jammin' Logs with Log Jammers at PAX West! You Heard Me!